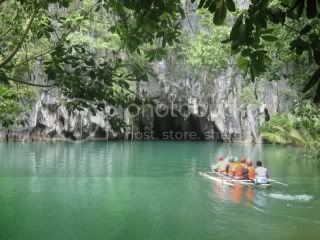 Subterranean River National Park, Puerto Princesa After dropping to the Top 20 last month, the Philippines’ four candidates for the New 7 Wonders of Nature are now showing a strong presence, landing on the top 11 in the live online ranking of 77 nominees from around the globe. As of the latest count, Puerto Princesa Subterranean River National Park is at No. 1, Chocolate Hills of Bohol is at No. 4, closely followed by Tubbataha Reef at No. 5, and Mayon Volcano is at No. 11. The New 7 Wonders of Nature is an ongoing campaign sponsored by the New 7 Wonders Foundation based in Switzerland. The same group initiated last year the New 7 Wonders of the World project, in which the seven new sites were officially chosen after a successful poll which posted 100 million international votes. Chocolate Hills, Bohol “We are pleased with the current rankings. But as the finale draws near, we should be more persistent in urging Filipinos to vote and actively promote our candidates,” dsif Ace Durano, secretary of tourism. Although the competition mandates that only one of the country’s nominees will be included in the official seven wonders, Durano said, having four strong candidates at this stage is a great boost for Philippine tourism. “The whole world is tuned in to this competition. Even if only one of our candidates remains in the final seven, we have gained so much publicity for our country as a destination with diverse natural sites,” Durano said. Tubbataha Reef, Palawan On the criteria for the nominees, Eduardo Jarque Jr., DoT undersecretary for planning and promotions said, “the nominees must meet one of the following criteria — it must be a natural site, a natural monument or a natural landscape. The 21 New 7 Wonders of Nature candidates will be competing for the last time in the finalist stage that will run from 2009 to 2010. Each of the finalists will have a chance to be presented to global voters through the New 7 Wonders World Tour which will visit and document each of the 21 nominated sites. Please, cast your votes now. Just click the link below..thanks..
ay kala ko tapos na to.. till 2010 pa pala.. hehehhe.. It deserves to have the top slot!